NES Who Framed Roger Rabbit (USA) in 05:08.28 by Tool23. 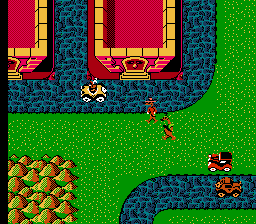 Who Framed Roger Rabbit is an action-adventure video game created for the NES by Rare in 1989. The game loosely follows the movie as the player wanders around Hollywood collecting items and figuring out Who Framed Roger Rabbit. In this run, Tool23 collects items which are spawned randomly in the world. The first item acquired is the whistle, which calls the taxi, which makes movement easier. The early deaths save time by skipping items which would otherwise need to be collected.